It’s National Gin day tomorrow (13 June), and we can’t think of a better way to celebrate such a boozy occasion than to bring together all of the best gin bars in the UK into one handy article. Whether you like yours floral, herbal or dry, these fantastic bars will have all of your needs well and truly taken care of. Heads and Tales is another gin bar, but not any old gin bar – it is in fact Edinburgh Gin by night. The distillery at 1a Rutland Place by day transforms into Heads & Tales after hours, and offers a plethora of gin-based cocktails to try. If you like your cocktails sweet, try an Otto Titsling made with Edinburgh Gin, vanilla, citrus & bramble or for something tangy a Savory Collins made with Hendrick’s Gin, cucumber and ginger. Tucked away and the end of Bermondsey Street, this intimate and friendly bar serves over 80 gins alongside a delicious array of carefully created cocktails, and is the home of hand-crafted BTW Bermondsey Tonic Water which allows the full flavour of each gin to shine through. A gin & tonic tasting flight invites you to try three different mini G&Ts, including a Tour of London option featuring the super light Little Bird from Peckham Rye, the bergamot-scented Half Hitch from Camden, and the aromatic Moonshine Kids Dogs Nose from W1. Atlas on Deansgate has been a Manchester institution for last two decades. They are a gin specialist with a whopping 170 different gins and counting – and a changing gin of the week at half price, so you can always try something new without breaking the bank. The Gin Bible menu with tasting notes and the knowledgeable staff will guide you through the extensive selection, and then you can relax on the sun terrace with your gin of choice. On the surface Pintura is and looks like your typical Spanish tapas bar, but travel a little deeper inside – into their basement to be precise – and you will find the biggest and best bar in the city. Their mixologist Nick Fox has kept with the Spanish theme in places and offers up ‘tapas style’ servings of gin called ‘Copas’ which he has specially tailored to show off the quality gin in the best way possible. Located within a 100m proximity of both Cardiff Castle and the Millennium Stadium, The Potted Pig is filled with both tourists and locals who crave a good gin while they take a break from their day to day business. The Potted Pig pride themselves on their international cuisine menu which they have thoughtfully paired up with their gin and cocktails list to give you the best experience of both fine things. With an extensive choice of London dry, floral, fruity and aromatic gins all split off into individual sections, they have something for everyone – no matter the palette. Dacantus is all about spreading the gin love and they’re currently leading a ‘Gin Revolution.’ This intimate Spanish restaurant is renowned for its Gin Lab ‘Specialty G&T Menu’ and their signature ‘Fish Bowl’ G&T glasses. Gin Tasting Sessions are available here for those who are keen enthusiasts, and for those who just want a grounding in all things gin. Although this venue is cozily small it adds to the atmosphere and gives the place real character. You wouldn’t think you’d just stepped off the streets of Newcastle. Billed as the hippest bar in Bristol, The Milk Thistle is one cool place to sit, relax and drink a few gins. Its location is hidden in one of the most beautiful historic buildings in the city and decorates itself in the style of a prohibition era speakeasy. For being such a hip place it doesn’t hold back on decadence, with private dining options, grand leather seats and surrounding antiquities – it does give its trendy customers an experience of luxury. If that wasn’t enough to convince you gin lovers out there then perhaps the promise of regularly hosted Gin club, which for £15 allows you to sample numerous top class gins, will persuade you to give The Milk Thistle your attention. Question: It’s Thursday night and you’re in need of some hard liquor, what do you do? Answer: Head on down to The Old House for their Gin Thursday celebrations. The bar is fully stocked with 69 delectable gins, meaning you have an array of choices from which to choose. If that’s not your cup of tea, there are also cask ales, spirits and, of course, cocktails. The interior of this friendly bar is one of its major selling points – the walls are adorned with quirky art, posters and even wee trinkets to boot. A bohemian hangout in the centre of Belfast, Muriels Cafe Bar is a hot spot for young gin loving socialites. 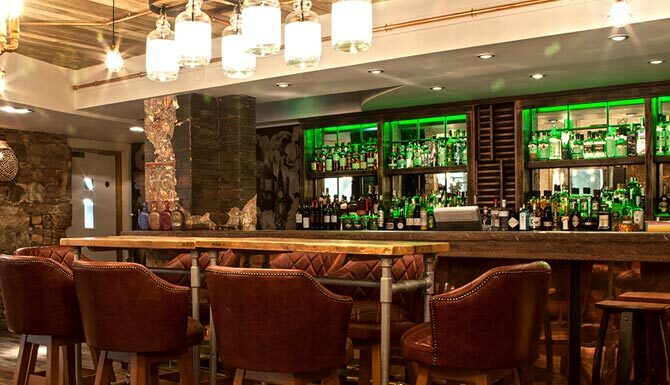 It’s the perfect spot to catch a gin at lunch while you tuck into their extensive brunch and dinner menu that comes with quite a reputation. If you can’t decide which of Muriel’s many gins to wrap your parched lips around then perhaps you should opt for a flight, allowing you to try three of their specialist gins at one order – perfect for those who are seasoned gin drinkers or newbies to the joyous juniper delight.